We’d love your help. Let us know what’s wrong with this preview of Don't Forget Dexter! by Lindsay Ward. Introducing Dexter T. Rexter, the toughest, coolest dinosaur ever. At least he likes to think so. When his best friend, Jack, leaves him behind at the doctor’s office, Dexter T. Rexter panics. First he tries to find Jack. Then he sings their special song. Then he sings their special song even louder. But when Jack still doesn’t appear, Dexter starts to wonder. What if he’s Introducing Dexter T. Rexter, the toughest, coolest dinosaur ever. At least he likes to think so. To ask other readers questions about Don't Forget Dexter!, please sign up. Be the first to ask a question about Don't Forget Dexter! He thought Jack was gone. This dinosaur has some serious anxiety and abandonment issues. The book was entertaining, my son liked to look at the pictures, and it was short enough to get through in a couple of minutes, before he stopped paying attention. This is a super little story for children aged 3-7 years old. I really enjoyed it! Dexter is a toy dinosaur belonging to a young boy called Jack. He finds himself being left alone at a doctors office. Will he find Jack, who has been gone forever? Has Jack found another friend to play with? This story is an interactive one that will entertain children, even those with a short attention span. However, I have reservations about a child's ability to read this book without help, especially the younger This is a super little story for children aged 3-7 years old. I really enjoyed it! This story is an interactive one that will entertain children, even those with a short attention span. However, I have reservations about a child's ability to read this book without help, especially the younger age range, due to the different font usage - from smaller to larger fonts, and the use of capitals. Having said that, depending on the reading ability, a child shouldn't have too much trouble in understanding the story due to the simple, concise, and engaging language the author uses. This story would make an entertaining bedtime story, but due to the interactive parts, not entirely a quiet read either. This could excite a child rather than settle them down for the night. Nevertheless, I did enjoy the story and the ending was rather sweet. Lindsay Ward has written a wonderful children's book about a neurotic toy dinosaur. I love how she tells a story in part rhyme, which makes it engaging for children. I would consider reading more of her books in the future, even though I am not her target audience. What an adorable and sweet book. It's a story about a toy T-rex that has been left at the doctor's office by his best friend Jack. He's afraid he's been abandoned and he spends the whole book figuring out a plan to get back to him. It reminds me a bit of Toy Story and the illustrations are super cute. Every time the T-rex sells himself as this big, scary creature, you see the actual scale of him and can't help but smile. Hello, friends! Our book today is Don’t Forget Dexter! by Lindsay Ward, the adorable tale of a little lost dinosaur looking for his best friend. Excuse me, but have you seen a little boy named Jack? You see, he came here to the doctor’s office to get a check up with his best friend, Dexter T. Rexter, but now Dexter is here alone and can’t find his best bud. Dexter has done everything he can think of to find Jack: he’s looked hard, asked the receptionist and the fish in the fish tank (neither answered him), he even sang their special song really loud! You don’t think – Jack wouldn’t have left Dexter on purpose… would he? Wonderfully cute. Dexter is the toy that every child has – they one they can’t live without, yet always manages to get misplaced once a week – and makes an adorably endearing hero in this lost and found story. The illustrations are bright and colorful, and give Dexter a lot of personality in his expressions and movement. The text is fun, using fourth-wall breaking dialogue and plenty of onomatopoeia to keep little ones invested. And don’t worry, the story has a happy ending, and can be used to teach children the importance of keeping tabs on their prized possessions (especially their beloved stuffed pals). The length is perfect, and JJ absolutely loved the “owange dinosawr!” This one is a great mix of fun and feeling, and we liked it a lot. Baby Bookworm approved! How would you feel if you were a loyal toy and you were left in the waiting room of the doctor's office? This is exactly what happens to Dexter T. Rexter. He was coloring with his best friend, Jack, when he looked up and Jack was gone. Dexter begins asking the reader, the fish, and he even tries to ask the receptionist where Jack is. He even begins singing their favorite song (very loudly) to get Jack to come back. What is Dexter going to do if Jack never comes back to get him? Read this fantastic book to see what happens to Dexter!! This is one of the cutest, funniest books I have ever seen!! You know when the cover of the book has humor on it, you will be in for a treat. Kids reading this will laugh out loud as you read this. I know this book will not stay on my shelf once I introduce it to my kids!! Any parent of a child who has lost a comfort object of toy will want to share this adorable picture book with his/ her child. Told from the POV of the lost object, the story will tickle everyone with it's humorous illustrations and over-the-top narration. We all know what happens when our children lose a beloved toy. But what about the toy? How does a beloved toy handle being lost? In Don't Forget Dexter!, Brobarians author Lindsay Ward explores this, and the result is both humorous and touching. Dexter T. Rexter thinks he is the toughest, strongest, coolest dinosaur there has ever been, or at least that's what he tells himself after he is left behind by his best friend Jack at the doctor's office. Scared that he will never see Jack again, Dexter We all know what happens when our children lose a beloved toy. But what about the toy? How does a beloved toy handle being lost? In Don't Forget Dexter!, Brobarians author Lindsay Ward explores this, and the result is both humorous and touching. Dexter T. Rexter thinks he is the toughest, strongest, coolest dinosaur there has ever been, or at least that's what he tells himself after he is left behind by his best friend Jack at the doctor's office. Scared that he will never see Jack again, Dexter does everything he can think to get back to his friend. In a bit of meta-fiction and a state of panic, Dexter turns to the most available person for help - the reader, explaining that he and Jack were coloring and then Jack was gone. But when the picture of Jack that Dexter colors doesn't help, he turns to the office fish, then the receptionist, but they aren't helpful, either. What can a scared dinosaur do to bring his best friend back? Of course, sing their favorite song, over and over, louder and louder. but...still no Jack. Then, Dexter has the scariest thought of all - what is he were left behind on purpose. replaced by a new best friend. Could that be possible? Will Dexter's story have a happy ending? Dexter is a wonderful "every toy" character and I loved reading his story, remembering a certain day I almost had to dumpster dive to find a beloved lost toy. Dexter's panic and desperate search for a way to be reunited with Jack should ring true to any parent whose child has lost their favorite toy. Young readers will also find this pretty funny, perhaps seeing themselves in Dexter's anxiety and insecurity, recognizing his despair and the sadness he feels that he may never get to do the things he loves doing with Jack ever again - no more fun, no more Jack. Ward's colorful illustrations, created using printmaking ink, colored pencil, and cut paper, reflect the story well, adding to the fear and tension of being lost and emphasizing Dexter's smallness in relation to the world abound him. So how did Ward come up with the idea for Don't Forget Dexter!? According to her, she was inspired to write this book after her husband texted her a photo of a toy dinosaur abandoned at a doctor’s office. The caption read: “Well, they left me here.” Lindsay thought it was so funny that she sat down to write Dexter’s story immediately. She is also the author and illustrator of Brobarians, Henry Finds His Word, and When Blue Met Egg. Her book Please Bring Balloons was also made into a play. Don't Forget Dexter! is the first book in a new series for Lindsay Ward. You can expect to see the next Dexter story, It's Show and Tell, Dexter! later this year. Had the kiddo laughing from the beginning.maybe his favorite New book. It's a good short story. We both love the artwork as well. Part of my Amazon Prime free book preview. The pictures were cute-ish, and the dinosaur was heart warming. I really felt bad for him. Dexter was a bit long for me and was starting to wear on me. My son and I had some mom/son time this morning and decided to give Dexter Dino a shot. Needless to say we loved it. Dexter Dino has such a cute art style and was a very easy, straight forward read. Perfect for my 6 year old. This is one of those books that expects reader interaction. The concept is cute, and potentially enjoyable for young readers; however, the story fell short. What a cute children's book! Dinosaurs are so much better than cars. RAWR! This is one of those interactive books, where the text implies that the child is talking to the book. I personally do not like those kinds, but for fans of Toy Story, it is that kind of story. Cute book! I was able to be very expressive while reading aloud because the words flowed. This is the first ebook I have ever read to my son. We usually read hardbacks so it took me a second to realize we had to hold the Kindle sideways. haha! Lovely experience. A very nervous dinosaur loses his best friend during a trip to the dentist. He tries everything he knows to get his friend to come back and find him. Good book to talk about separation anxiety with preschool children. I really, really enjoy reading Dexter with my grandsons! Dexter is the new dino on the block. He has anxiety issues -- this one stems from being left behind in the doctor's waiting room. He experiences a wide range of emotions as he works through this anxiety. It disappears as soon as Jack walks into the waiting room and sees him. Creative use of font changes will help readers to read this one-sided conversation with expressiveness. Ward's illustrations were created using printmaking ink, colored pencil, and cut paper. They are bright and cheerful -- a Dexter is the new dino on the block. He has anxiety issues -- this one stems from being left behind in the doctor's waiting room. He experiences a wide range of emotions as he works through this anxiety. It disappears as soon as Jack walks into the waiting room and sees him. Creative use of font changes will help readers to read this one-sided conversation with expressiveness. Ward's illustrations were created using printmaking ink, colored pencil, and cut paper. They are bright and cheerful -- a great context to the anxiety that Dexter experiences. A welcome addition to early literature for young children. A cute picture book for the preschool crowd! With a stuffed dinosaur as the narrator, we experience the anguish of a favorite toy when he is left behind. I look forward to sharing this with my 4K classes - I think they will love the little song/chant and all of the different dramatic declarations Dexter makes as he worries about his boy never coming back. The illustrations are all in variations of blue and orange and there is great use of different fonts and word size/emphasis for a storytime se A cute picture book for the preschool crowd! With a stuffed dinosaur as the narrator, we experience the anguish of a favorite toy when he is left behind. I look forward to sharing this with my 4K classes - I think they will love the little song/chant and all of the different dramatic declarations Dexter makes as he worries about his boy never coming back. The illustrations are all in variations of blue and orange and there is great use of different fonts and word size/emphasis for a storytime setting. Super Read for Dino Tot Fans! My son loved reading this book before bed. He loves T Rex & got a kick out of Dexter T. Rexter's name. & he was quiet the entire time while reading & looking at the pictures. The story: a toy dinosaur named Dexter has been forgotten in a doctor's waiting room by his "best friend, Jack." He feels like it's been forever since he's seen Jack, and asks the reader if they've seen him. Then he asks the goldfish and the receptionist, and begins singing loudly in hopes Jack will hear him. He starts getting scared that he was left intentionally, and that maybe Jac Cute story about a misplaced toy. I absolutely adore this book! Dexter T. Rexter is the coolest dinosaur around. He lives with his best friend, Jack. One day, the pair go to the doctor for a check-up. 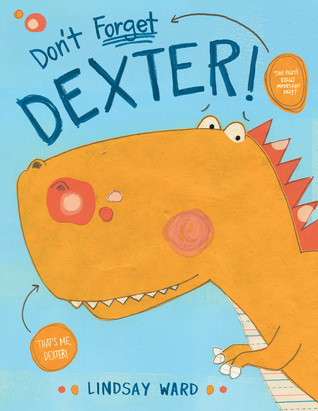 Dexter is a T-Rex who’s a lovable softie, the playmate of a child who accidentally forgets him in the pediatrician’s waiting room. When Dexter realizes he’s alone he sets out to find his friend Jack, drawing a picture of him, trying to get the attention of the receptionist, and singing their special song in the hope that Jack will hear it and come back. Dexter’s efforts grow increasingly frantic as he fears that Jack has left him on purpose, in favor of a better toy, and he becomes determined to Dexter is a T-Rex who’s a lovable softie, the playmate of a child who accidentally forgets him in the pediatrician’s waiting room. When Dexter realizes he’s alone he sets out to find his friend Jack, drawing a picture of him, trying to get the attention of the receptionist, and singing their special song in the hope that Jack will hear it and come back. Dexter’s efforts grow increasingly frantic as he fears that Jack has left him on purpose, in favor of a better toy, and he becomes determined to find his way back home. 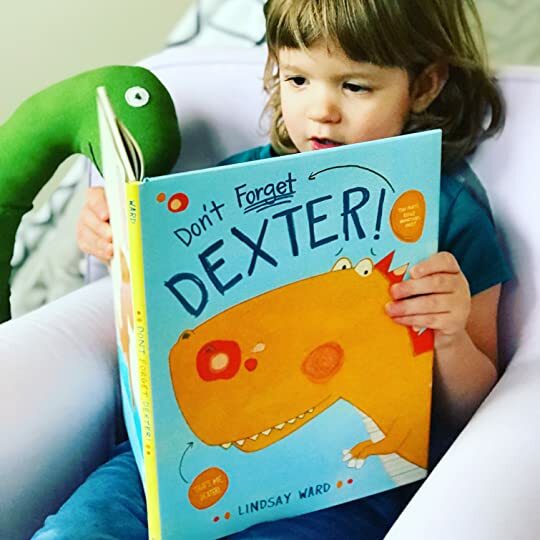 In Don’t Forget Dexter, author Lindsay Ward captures the way children often see their playthings as being able to think and feel. While telling the story from the toy’s point of view she is able to portray a variety of emotions in this sweet picture book: happiness, fear of abandonment, joy, sadness and more. And parents will likely have a lot of fun reading the story aloud, as Dexter scratches and roars and chomps and sings and splashes and cries in despair. 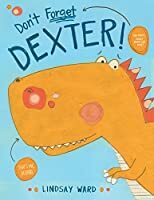 A word of warning: Dexter, with his cute little nose bumps, oversized head and swishy tale is likely to inspire cries of, “I want a dinosaur!” from children who fall in love with him on the page. After reading Don’t Forget Dexter (probably over and over), what parent could resist? Synopsis: "Introducing Dexter T. Rexter, the toughest, coolest dinosaur ever. At least he likes to think so. This hilariousl Synopsis: "Introducing Dexter T. Rexter, the toughest, coolest dinosaur ever. At least he likes to think so. Trivia About Don't Forget Dexter!